We had the Privilege of The Undercover Waiters performing at our Wedding last Friday. They were absolutely Fabulous. Professional and full of fun. Fantastic Voices, catching out all our guests. Played to the audience and created a wonderful atmosphere to start the party off. Thank You. We got your card from Anai and Scott?s wedding in Cottrell park yesterday, we were so impressed and both loved you guys. Me and Will are getting married on Monday 2nd September 2019 and would love you to be a part of it! We got married last Saturday 1st September at Lakeside venue, Glun Ogwr. Andy was our singing waiter and can I just say he was absolutely brilliant! Everyone loved him! He was so funny and entertaining that?s all everyone has been speaking about! He got everyone up and dancing and really got the party started! Could you pass on a massive thank you from me and my husband and everyone at the venue please as this is the only contact i have for him. He really is brilliant at what he does and I would recommend him 100%. WOW! What can I say, Michael came to our wedding yesterday and was just unbelievable. He made all the guests laugh and really made an effort to bond with them before his performance. He had every single one of my guests on their feet dancing and created an amazing atmosphere. If you have a special event coming up I would 1000% recommend you get in touch with these guys. Thank you so much Michael! I booked Adam & Michael for the Gala Dinner at our annual conference and they were awesome! No-one suspected anything as they went around the tables.... they were funny and so entertaining and wow can they sing! Over 300 people in attendance and every single person was up dancing! Book them, you won?t be disappointed. If you want a fantastic entertainment at your venue, then you have to book these guys. They are terrific. Adam was the undercover waiter disguised as Mario & surprised everyone. What a great entertainer. He had everyone involved in the show. He made the special day extra special. There is something for everyone. 5 stars are not enough. One of the best live acts I have seen. A must see & definitely recommend undercover waiters for all you party entertainment. 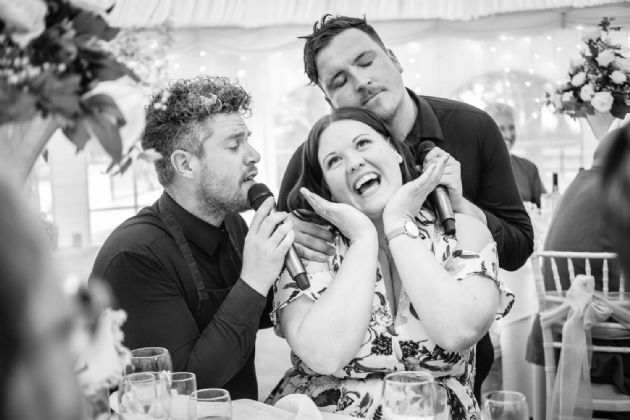 Michael and Craig performed at our wedding yesterday at Ringwood Hall Hotel and were brilliant. No one had a clue and had so many guests saying how unique it was. From booking to the day it's self they reassured me and made sure it would be a great day. Worth every penny. We hired The Undercover Waiters to surprise our wedding guests a couple of weeks ago. Firstly id just like to thank Michael who was our waiter, you were AMAZING! Absolutely perfect, you really fit in, you were extremely professional, very friendly but most of all very convincing! Not to mention your voice is so talented. The guests absolutely LOVED the surprise, as did me and my hubby! We are so glad that we went ahead and booked after considering it for a little bit! It actually made the day! Everyone sitting quietly enjoying there meal then all of a sudden we were dancing singing away at 4pm in the afternoon! Dont think many people were sat down! You really lifted everyone up, and had everyone smiling and having fun! Was a talking point for the night and still now! My little boys still watch the videos on my phone all the time! Thank You, Thank You, Thank You! For More Live Entertainment Ideas and inspiration for your Wedding, Event, Venue or Function. ©2019 Copyright The Undercover Waiters.